Short Product Description: Delighted moisturize soap with strong orange essential. This natural soap is handmade in small batches with 8 natural oils and butter to create a creamy rich moisturizer soap, and free of any phthalates, parabens, chemicals or gross stuff. A nice citrusy scent can be invigorating and rejuvenating during a bath or shower. 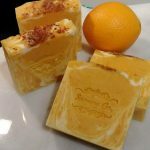 Sweet Orange natural soap is also an antiseptic and an anti-inflammatory. It can have an aphrodisiac effect, can remove toxins from the skin and is a natural antidepressant. Company or Makers Name: Soapery Co.